Hopleaf deal to purchase La Donna space collapses Reviewed by Edgeville Buzz on December 9, 2008 . 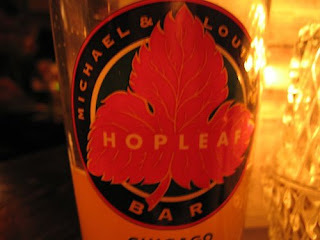 The owners of Hopleaf Bar at 5148 N Clark had plans to purchase the two-story building currently owned and occupied by La Donna Restaurant, but that deal has collapsed according to an article today in Crain’s Chicago. The purchase fell through when Edgebrook Bank withdrew its financing, although co-owner Michael Roper said he still plans to purchase the space and open a tavern that would serve Mediterranean-inspired cuisine and offer a beer selection that would rival the more than 150 varieties served at Hopleaf. La Donna has put its plans to move north on Clark street, as previously reported by the ECB, on hold although it still plans to move forward with the purchase of the location at 6340 N. Clark.